A fifth of our waste is packaging – that’s five million tonnes of household packaging waste in the UK every year. Packaging is needed to protect products, particularly food, but too much is a big waste! So next time you are out shopping remember to Think Packaging! 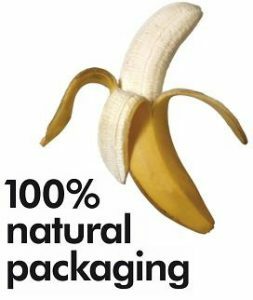 Packaging helps to protect products and can help food to last longer, which helps to reduce waste. Unwrapped cucumbers are often un-saleable after three days, but using just under 2 grams of packaging can keep them fresh for up to 14 days. Packaging is also needed to transport products without damaging them. Even though some packaging is necessary a lot of products have excess packaging which can mean the product costs more! Packaging is also often sent to landfill as it can be difficult to recycle. Most products with excess packaging could use less packaging, or smarter packaging, such as recyclable material, to give the same amount of protection. Look for products with less packaging; many companies are promoting how much they’ve reduced their packaging. Products with no packaging, such as loose fruit and veg, are even better! Buy products that use recycled packaging and can be recycled in your local area. Buy concentrated products and refill packs instead of fully packaged products, such as fabric conditioner, washing powders and some beauty products – this can save you money too! Use plastic ice cream tubs for storing leftover food in the fridge. Paint old jam jars with glass paints to make nightlights, or use them to store homemade chutneys. Use empty biscuit tins to store spare buttons or screws. Create works of art with your children using empty cereal boxes, crisp packets and plastic bottles. Cans and tins – Your steel and aluminium food tins and drinks cans are widely recycled. Don’t forget to rinse them out first. Glass – Glass is widely recycled. Don’t forget that as well as wine and beer bottles you can recycle sauce jars, coffee jars and even Marmite jars. Cardboard – Cardboard packaging can be recycled too. Things like cereal boxes, ready meal sleeves and tea bag boxes can all be recycled. Plastic bottles – These are widely recycled. Don’t forget you can recycle things like shampoo and bleach bottles as well. Other plastic – Item such as yogurt pots and margarine tubs can be recycled at your local Recycling and Household Waste Site. Don’t forget to recycle your plastic food trays too. Some kerbside recycling collections may also collect these materials. Plastic bags – Reuse your plastic bags where possible but if you need to dispose of them they can be recycled at most Recycling and Household Waste Sites and supermarkets. If you spot an item which you think has excessive packaging you can complain about it, which should encourage the manufacturer to look into reducing their packaging. Write to the supermarket or manufacturer to complain, asking why they are using so much packaging. Introduced in 2005, the Courtauld Commitment is a voluntary agreement between WRAP (Waste and Resources Action Programme) and various grocery retailers, suppliers and leading brands who have signed up with the intention of reducing food and packaging waste. As a result, 670,000 tonnes of food waste and 520,000 tonnes of packaging were avoided between 2005 and 2009.